BikeWalkKC is currently supporting the KCMO Bicycle and Pedestrian Advisory Committee (BPAC) in their efforts to craft a strategic plan for future investments in the city’s bicycle infrastructure. As part of that effort we are developing a bicycle network demand analysis to determine which streets have the highest demand for cycling. The key findings are shared here for public input to help inform the City’s future strategy for infrastructure planning and investment. Be sure to give your input below. Strong demand in the Downtown to Plaza central corridor and in the Historic Northeast. Key gaps include a routes connecting Downtown-Westport-Plaza and in the densest part of the Northeast. Investments planned over the next five years are much more aligned to the demand and areas of highest need, providing good potential for a connected network serving the areas of highest demand and highest need. The highest demand for cycling is found in Downtown, Westport, and the Plaza. High demand also exists in the corridors connecting these nodes, as well as large portions of the historic Northeast. Pockets of high demand follow parkways through developed areas of the East Side and Northland. Generally, high demand areas are those with a combination of many potential destinations, high population densities, and a diverse mix of uses. Many streets with bicycle lanes are located in areas with low to moderate demand. 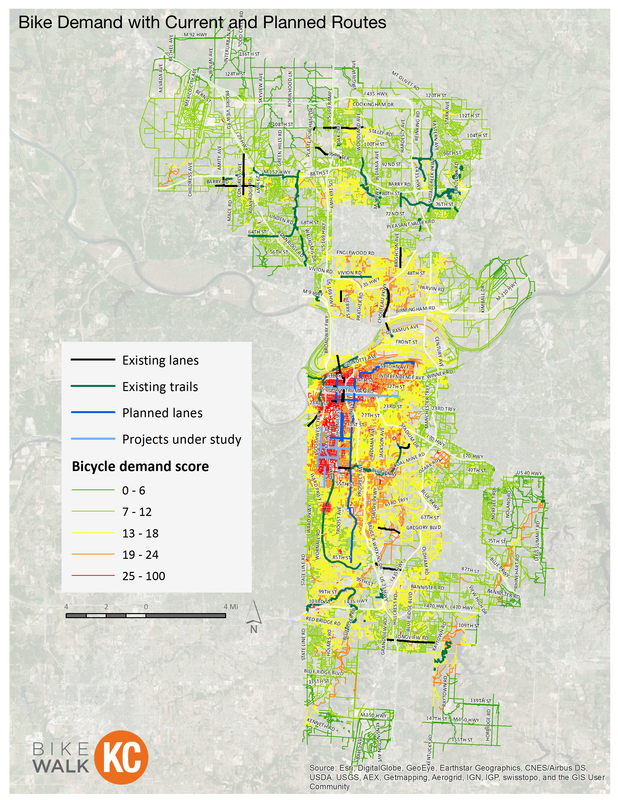 Existing bike lanes on Emmanuel Cleaver, Chouteau Parkway, and Charlotte/Holmes are located in higher demand areas. Planned improvements throughout the urban core are poised to serve areas of high demand much better, but key areas of need remain, including a north-south route connecting Downtown, Westport, and the Plaza, and a route serving the densest parts of the historic Northeast. The entire Bike Network Demand Analysis is available for download here. Let us know what you think! We will share all feedback with City Manager, Bike/Ped Advisory Committee, and staff in the Public Works, Planning, and Parks Departments.